Take the thinking out of Boiler Plus. Fit any of the thermostats below and we guarantee you will comply with the new regulations. 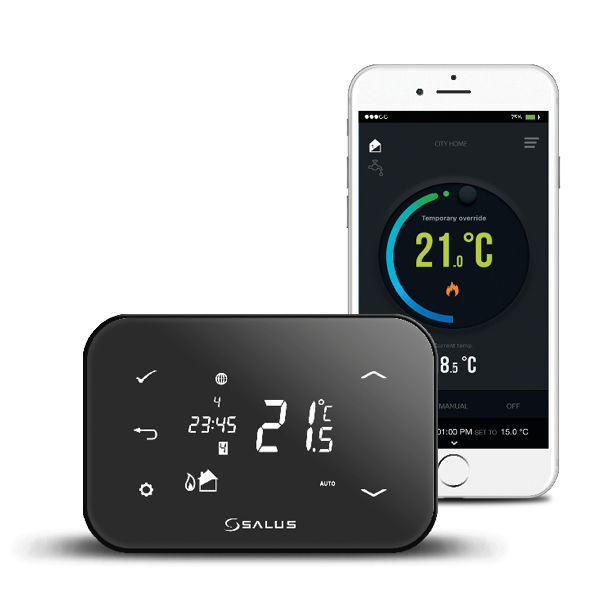 The RT520 and RT520RF are the latest additions to SALUS’ tried and tested RT range of thermostat heating controls. With a new on-board load compensation feature, they offer the most cost effective fully compliant Boiler Plus solution on the market, providing the homeowner with optimum efficiency and maximum heating control comfort. Available in both wired and wireless RF versions, the new RT520 series include all the features of the previous RT series with a larger more intuitive LCD display and a handy new suite of additional operational and efficiency functions. 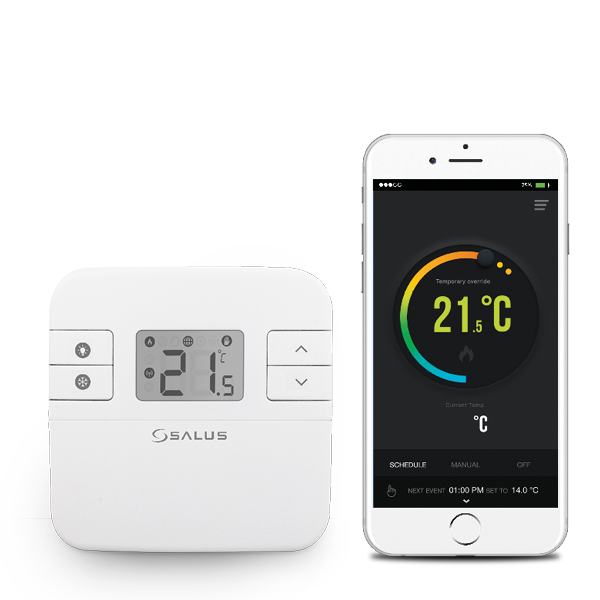 The most affordable, easy to use Smartphone controlled thermostat, for single zone heating solutions. Features include: Simple to add heating schedules, holiday mode, frost protection and distance alerts. 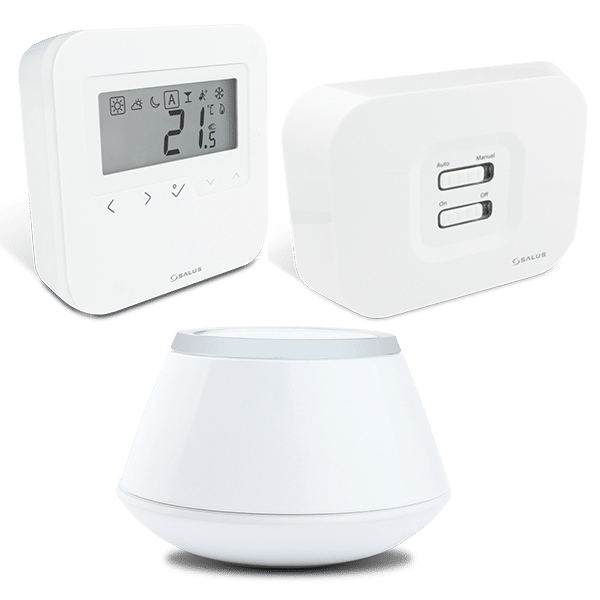 A stylish Smartphone controlled thermostat with three heating configurations: Single zone heating, heating and hot water or two zone heating control. Features include: Simple to add heating schedules, holiday mode, frost protection and distance alerts. An introduction to our premium range Smart Home system. This pack controls one heating zone but can be easily expanded to a multi-zone system with the addition of zoning packs. It comes with a FREE SP600 Smart Plug, so that you have the added benefit of controlling and scheduling one electrical device or appliance from the SALUS Smart Home app. You can see more products from the Smart Home range by visiting our website. SALUS Controls welcomes the UK government’s newly introduced energy initiative commonly referred to as Boiler Plus. We believe that this is an important legislative step that will ensure homeowners receive the most effective and efficient domestic heating system to save maximum energy and cost. Our Boiler Plus range provides thermostats with onboard load compensation and a range of connected thermostats with optimisation and automation. The new standards we have outlined in the Boiler Plus Policy Document improve the way many people use energy in their homes by giving them greater choice, greater control and tangible savings on their energy bills. The new minimum performance standard for domestic gas boilers in English homes will be set at 92% ErP. The standard will also make timers and room thermostats an explicit requirement for all gas and oil systems, putting beyond doubt the need to give consumers the power to achieve the greatest comfort in the home. When a gas combination boiler is installed, an additional energy efficiency measure will be required. Defined as a device which pre-heats the domestic hot water supply by recovering heat from the boiler’s flue emissions. Defined as a control function which maintains internal temperatures by varying the flow temperature from the heat generator relative to the measured outside air temperature. Weather compensation interacts intelligently with the boiler to reduce water temperatures, which increases efficiency without compromising user comfort. Automation is a control function that automatically adjusts time and temperature settings, based on occupancy detection, geolocation and/or stored data from user adjustments over time. Optimisation is a control function which starts the boiler operation at the optimum time to achieve the setpoint temperature at the start of the occupancy period. Defined as a control function which maintains internal temperatures by varying the flow temperature from the heat generator relative to the measured response of the heating system. These devices measure the gap between what the internal temperature is and what the user wants it to be and modulates the boiler so that it only uses as much fuel as necessary to close the gap. Which installation should I choose? The Thermostat or programmer needs to be replaced. There is no change to the existing boiler. Any current or future SALUS Thermostats or programmer can be used as a replacement. The system includes a new install or replacement gas System boiler. Any current or future SALUS Programmable Thermostat, or a mix of room thermostats and programmers can be used for this install. The system includes a new install or replacement combi boiler as well as a Flue gas heat recovery and/or a weather compensator. Any current or future SALUS Programmable Thermostats can be used for this install. Flue gas heat recovery and/or a Weather Compensation. The system includes a new install or replacement combi boiler but without Flue gas heat recovery and/or a weather compensator. 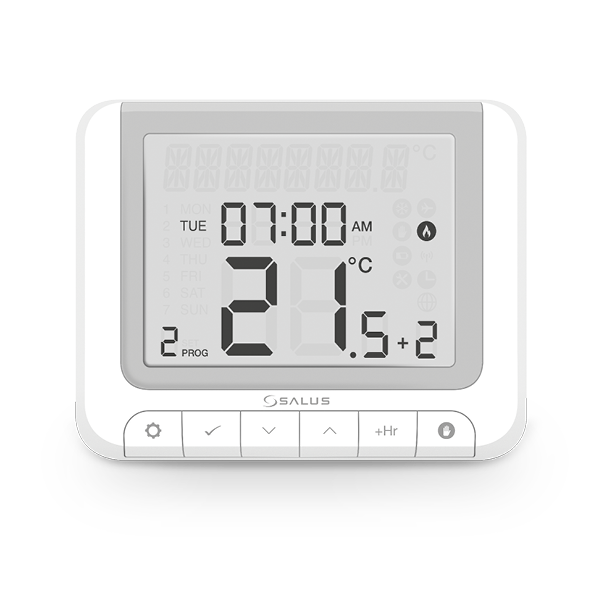 A SALUS Internet connected Thermostat with Automation and Optimisation features can be installed. The system includes a new install or replacement combi boiler but without Flue gas heat recovery or a weather compensator. The customer prefers a simple non internet connected solution. A new updated RT series model will include a Load Compensation feature option, to make the unit compliant as a Load Compensation Device, perfect for older or non-tech savvy users.